The Perth Mint is pleased to present the first-ever Australian Kangaroo 1 oz Silver bullion bar. Struck in .9999 fine Silver, this Australian Silver bar is a treasure for collectors and is sure to be an instant worldwide success. The bar has a simple yet elegant design which on the obverse features the popular LMBA registered Perth Mint logo, the Swan in a 3D relief. Each individual bar has been struck between two dies to achieve the 3D relief design. A table of radiating circles surrounds the beautiful logo which is also an anti-counterfeit feature. The content, weight, and purity of the bar are engraved on the front below the mint logo which says “9999 FINE SILVER 1 OUNCE.” The last ‘9’ of the fineness 9999 is incorporated with a small ‘P’ mint mark which serves as an anti-counterfeit feature. Similar to the Perth Mint’s wide range of Kangaroo gold bars, this silver bar also features small kangaroo designs in diagonal rows. These motifs are arranged in repetitive diagonal rows to form a lovely pattern on the reverse of the bar. The 1 oz size silver bar is a perfect investment option for any precious metal investor. 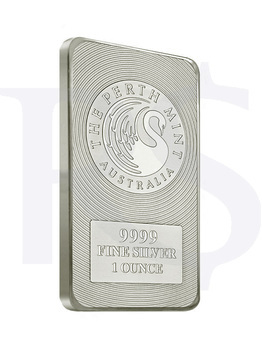 The latest release from the Perth Mint will be a wonderful new addition to your collection. Perth Mint is a world renowned institute and is held in high esteem for its technologically advanced methods of minting coins and bars, impeccable finish, superior craftsmanship, and undebatable quality. Single bars come in an individual bar capsule, 15 bars come in tubes, and 150 bars come in 10 tubes boxed in durable card packaging.